Hello, ribbon lovers! 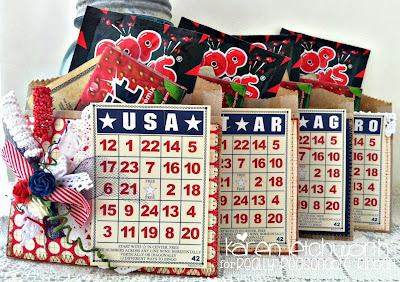 Today I'm sharing some sweet little treat bags I made for my nieces and nephews for the 4th of July. I'm SO excited to share the holiday with them this year. I created one treat bag for each of them using some amazing products from Really Reasonable Ribbon. I forgot to make this post when I was originally supposed to, so I'm sharing it now. 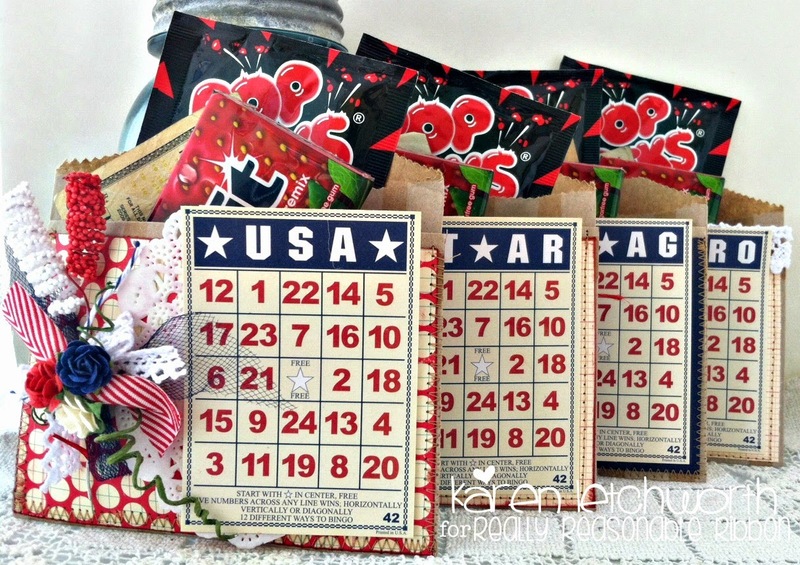 I started by taking a Middy Biddy Kraft Bag With Horizontal Stripes and creating little pocket cards for each of them. As I've mentioned before these "middy biddy" bags are not small. They're a generous 5" x 7.5" and they're now ON CLEARANCE for just $1.65/package of 10 bags. This is a great time to grab them before they're gone! They make the cutest little treat holders. 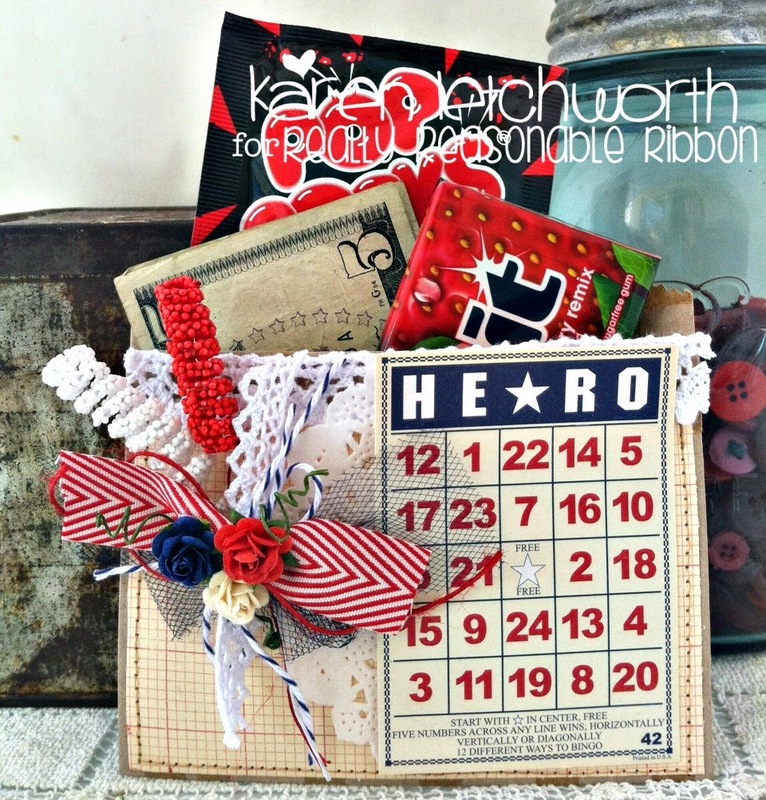 Once I had my Middy Biddy Bags folded, covered with patterned paper, and stitched down, I added to each of them a half doily, patriotic journalling card (USA, STAR, FLAG, and HERO). Next, I grabbed my FABULOUS Really Reasonable Ribbons and went to town adorning them. I used Wild Orchid Crafts Spiral Stamens which were recently RESTOCKED. I used the White Spiral Stamens and the Red Spiral Stamens. I also incorporated Blueberry Baker's Twine, Cherry Baker's Twine, Red Chevron Striped Twill, and Victoria White Lace which you can see in the above photo. I tried to make each one look similar, yet unique. Because Really Reasonable Ribbon has SO MANY great ribbons, laces and trims, it was easy to make each one unique. 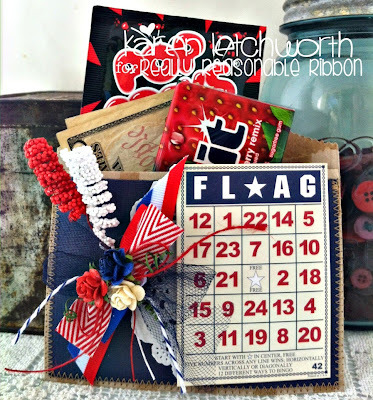 The next bag also incorporates ribbons from this month's Ribbon of The Month Club including the 5/8" Red White and Blue Striped Grosgrain Ribbon as well as some of the Red Burlap String. The Burlap String comes in a wide array of colors, and is just ten cents per yard. It gives your cards a soft, lovely touch. The above pocket card also includes another ribbon from this month's Ribbon of The Month Assortment, and it is the adorable new Tiny Electric Blue Stars on White Grosgrain. 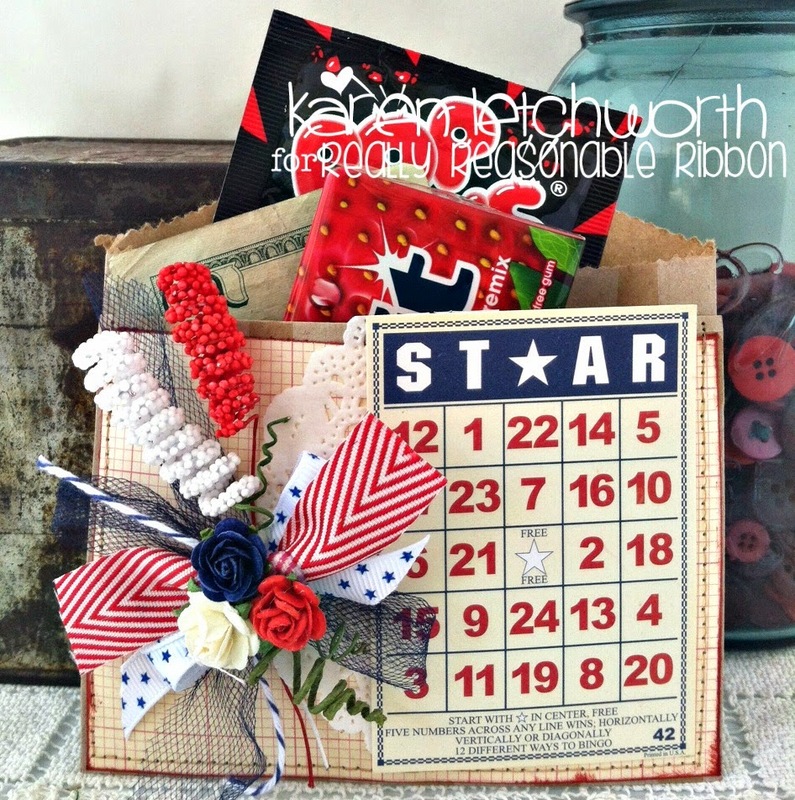 This ribbon is great, not only for 4th of July, but also for boy cards and other projects. The blue really is "electric" and quite beautiful. In addition to all the lovely ribbons, twines, and laces I've used on these projects, I also added several of our BEAUTIFUL Mulberry Flowers including the Deep Ivory Open Roses, Open Roses in Red, and also the Royal Blue Open Roses. 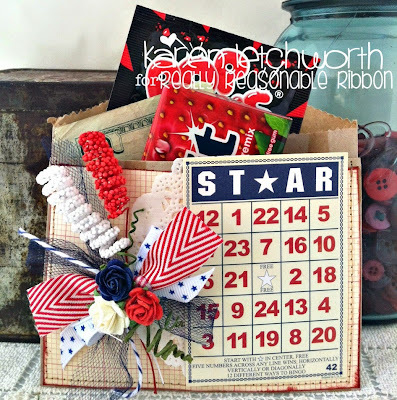 All the fabulous products at Really Reasonable Ribbon work together and compliment one another so nicely. And YOU can make these for yourself - Really Reasonable Ribbon has it all. Just follow my colored links, place the items in your cart, and there you go! And as I said, you need to get yourself some of those fabulous CLEARANCED Decorative Bags before they're gone. Again, they're just $1.65/10 bags, and now you can see how fun they are to decorate! Thanks so much for stopping by. You're warmly welcome to visit the Really Reasonable Ribbon Blog to play along in their Masculine Card Challenge. We absolutely LOVE seeing your projects. Karen -- These are the sweetest bags ever. I need to figure out how to become one of your nieces. 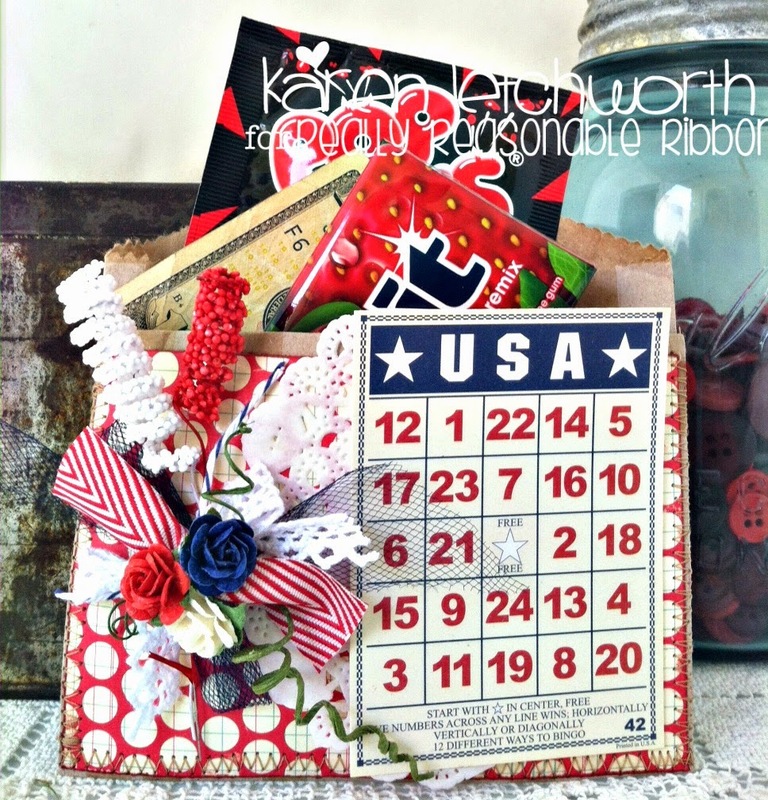 These are gorgeous, Karen and so patriotic. They'd be perfect for July 4th celebrations too. Thanks for your sweet comment on my blog. Home for me is in West Virginia, but I'm currently based in the UK. Oh my goodness Karen these are amazing!!! Love the vibrant colours and those goodies will melt any child's heart! !